The Newport 462-XY-M ULTRAlign Precision Integrated Crossed-Roller Bearing Linear Stage is made of Stainless Steel for Thermal Stability and excellent Rigidity. With its thermally matched crossed-roller bearings this stage can handle a load of up to 43 pounds, while offering smooth translation. 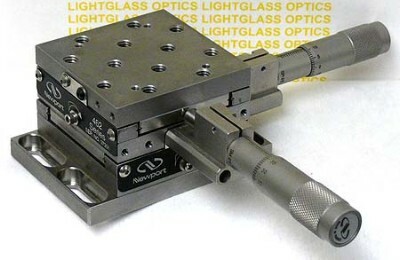 Total travel of each axis is one inch, with the included Newport SM-25 Micrometer Actuators. The top plate of this stage is drilled and tapped to accept both 1/4-20 and M6 fasteners. If you need a lower profile, the mounting base can be removed, allowing direct mounting on breadboards and optical tables with 1" center holes..